This will be a short entry, but I just wanted to give you guys some news! In DLC news, there was new Korean DLC released this week. It is called a Samgyetang Bowl. 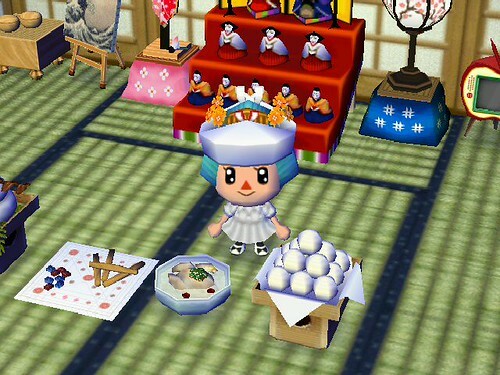 (It’s the white bowl of soup next to the rice balls.) If you’re wondering what the heck Samgyetang is, here’s some info! “Samgyetang, sometimes called chicken ginseng soup, is an energizing soup-based dish. It is traditionally served during the summer for its nutrients which can easily be lost through excessive sweating and physical exertion during the hot summer.” Want even more info… like how to make this dish? Check out this Samgyetang Recipe! Hello again! Thanks for reminding us about the fireworks this month!! Augus and the fall is definitely my favourite time of year as well! When does te Acorn Festival begin? Thats another favourite of mine! More dlc I’m missing! Am I correct in assuming it has to sit on the floor?